If you love football and you’re LGBT+ or an ally, you won’t want to miss this! Two Brewers Clapham, London’s friendliest LGBT venue, is screening selected World Cup games LIVE this summer – and they’re encouraging everyone who wants to enjoy the action with fellow fans who are LGBT to come along. The Brewers, located on Clapham High Street, is the regular haunt and also sponsor of London Titans FC, who play in the London Unity League and are also members of the Gay Football Supporters’ Network. And in conjunction with both, Sports Media LGBT+ is ‘hosting’ a special Sunday afternoon doubleheader on 17 June, featuring two of the tournament’s big guns. On that day, the Brewers will show reigning world champions Germany take on Mexico (kick-off 4pm), followed by five-time winners Brazil’s clash against Switzerland (7pm). Sports Media LGBT+ is the industry network group which advocates for all those involved in sport who are LGBT+, through media and journalism. We want to bring together fans, local players and teams, journalists and anyone else experiencing World Cup fever, to enjoy the very best of the beautiful game at the friendliest LGBT+ venue in town. So join us from just before 4pm on Sunday, June 17, to soak up the big match World Cup atmosphere in the Brewers! Hit ‘Going’ on this Facebook event to make it official! And there’s more! 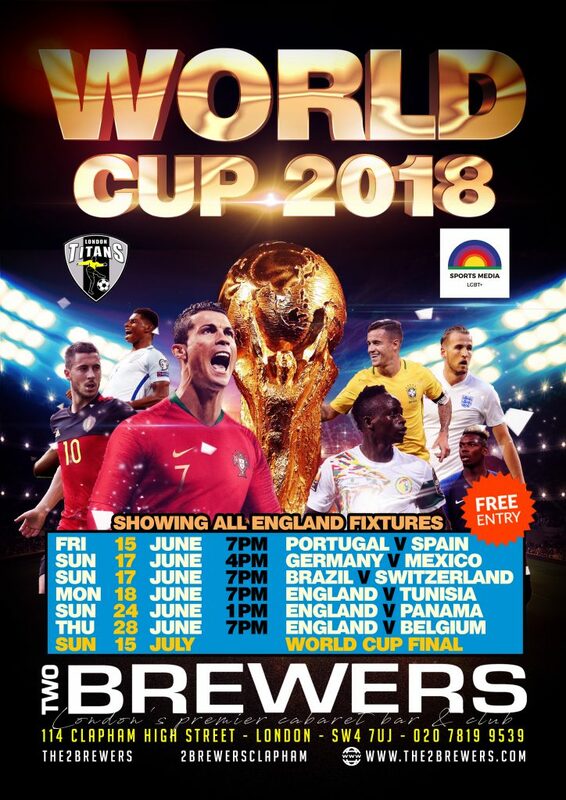 Two Brewers Clapham will also be showing EVERY England game LIVE too, with Group G matches v Tunisia (Mon 18 June, 7pm), v Panama (Sun 24 June, 1pm) and v Belgium (Thu 28 June, 7pm). More games are due to be announced as the tournament progresses, all the way up to the final on Sunday 15 July.